1095 1095 0% off in Rs. A plantation is a long, artificially-established forest, farm or estate, where crops are grown for sale, often in distant markets rather than for local on-site consumption. The term plantation is informal and not precisely defined. Plantations are developed on a large scale as the crops are grown for commercial purposes, not for local consumption. A plantation is always a monoculture over a large area and does not include extensive naturally occurring stands of plants that have economic value. Because of its large size, a plantation takes advantage of economies of scale. Protectionist policies and natural comparative advantage have contributed to determining where plantations have been located. Industrial plantations are established to produce a high volume of wood in a short period of time for each society. Plantations are grown by state forestry authorities (for example, the Forestry Commission in Britain) and/or the paper and wood industries and other private landowners. The plantation depends on a plentiful supply of cheap labor, not in the sense that its cost is low in relation to its productivity but in the absolute sense that wages are low because skills are few. For the plantation derives whatever economic advantage it has from its ability to mobilize unskilled labor to achieve greater economic return. Under certain circumstances the plantation, either private or public, enjoys distinct economic advantages over other types of farm organization. When it is desirable to introduce a new technology requiring a radical change in cultural practices, the plantation substitute's supervision-supervisory and administrative skills-for skilled, adaptive labor, combining the supervision with labor whose principal skill is to follow orders. India has a long tradition of floriculture. Rose is the principal cut flower grown all over the country, even though in terms of total area, it may not be so. The larger percentage of the area in many states is used for growing scented rose. More than two thirds of this large area is devoted for production of traditional flowers, which are marketed loose e.g. marigold, jasmine, chrysanthemum, aster, tuberose etc. Mushroom is an exotic and nutritious source of vegetarian food. It is a major horticulture product all over the world and is also becoming popular in India. Fresh mushrooms have very limited shelf life but dried and packed mushrooms have considerable shelf life. The content of the book includes information about plantation. The major contents of this book are project profiles of projects like teak plantation, eucalyptus tree plantation, cut flower (rose), mushroom (cultivation and processing unit), papaya cultivation, rubber plantation, Shisham plantations, Amla plantations, tea plantations. Project profile contains information like introduction. Uses and applications, market survey, supplier's addresses, plant economics, land and building, plant and machinery, other fixed assets, fixed capital, working capital requirement/annum, salary and wages/annum, utilities and overheads, total working capital/annum, cost of projects, total capital investment, cost of production/annum profit, rate of return, B.E.P. Mushroom is an exotic source of vegetarian food. It is button shape when young, but assumes the shape of an umbrella, when fully matured. Most of its varieties are edible and form a tasty and nutrious diet. Mushrooms are usually grown as a fall, winter and spring crop in special structures where the required temperatures can be maintained and where other necessary conditions can be provided. They are a difficult crop to produce. Mushrooms are widely used as a vegetable all over the world. This vegetable is better for health because it contains carbohydrates such as sugar, starch, cellulose, or lignin and vitamins. Mushrooms are usually grown as fall, winter and spring crop in special - structure where the required temperatures can be maintained and where other necessary conditions can be provided. Their are difficult crop is produce. Apart from their usefulness as food, Cultivated Mushrooms have their applications-especially as condiments, as drugs, as a source of enzymes as a component of nutrient agars and potentially as animal feed. The most important use of mushroom is as an article of food and its value as such is beyond the reach of the chemist or physiologist. In addition, mushrooms possess great value as condiments of food accessories. Mushrooms are among the most appetising of table delicacies and add great flavour to food when cooked with them. In India, commercial mushroom growing was first initiated in New Delhi and Salem and later it spreads to J & K, the Nilgiris, Punjab, Haryana, Chandigarh, U.P., Maharashtra, M.P., and Gujarat. The efforts made so far for the development of mushroom cultivation in the country are riddled with misperceptions and wrong representations. A detailed study of the developments till 1990 appeared as an article in that year's The Hindu Survey of Indian Agriculture, titled "Far from a mushrooming growth". Mushrooms are one of the foremost items of international trade in fresh dried and processed food mainly because the rate of growth in their consumption and production is the highest among agricultural commodities internationally. India can use them as one of the prime tools for agricultural development as well as for fighting malnutrition in the country. Till date there is no any Indian Standard specification has developed for plant processing for Mushroom, so this report does not concern any Indian Standard Specification. Mushrooms can be grown in any structure where it is possible to control ventialation, maintain a pasteurizing temperature of 130o - 145oF. For several days during sweating out, provide a humadity of 70-85% kept the temperature at 50-65oF, preferably crop is grown in specially constructed house. A good bed for mushrooms is one built in tiers, 2 feet being left between boards of each bed, and the bottom bed 6 inches off the floor. A house 1,200 sq.meter with 2 tiers 15 Ton Mushroom Production house size 40 x 30 height 12 ft. A ton of manure will produce 125 Kg mushroom. 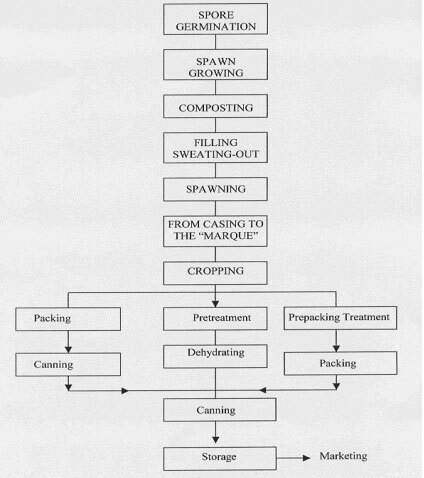 The "short compositing method consists of two distinct phases, the first tasting six to nine days, takes place outdoors under reduced oxygen pressure and with a high ammonia concentration. The ends is built up after the addition of water. The outer part of the pile, 10 to 15 cm in diameter is compacted strongly so as to counteract the loss of ammonia by evaporation and a decrease temperature. The internal portion, losser intexture must rapidly seed,75oC and pH of over 8.5 Two turnings are made at two to three days intervals, all being finished by seventh day of composing. The second phase takes place in a pasteurization chamber of the pressure of oxygen (20 percent and good air circulation with a humidity approaching 100 percent and over temperature of OoC to 60oC. Under these circumstances, phase two taste only twelve to twenty from homs for the moment when all trees of Ammonia in the compost has gone, as fan it can be detercted by small. The pasteurization chamber, in practical growing, will be in place indentical with the are where sweating out case, phase two is accomplished by the use of the tray system. In our further discussion we shall therefore mention only three most desirable types of beds molten order. The best raw material for mushroom compact is manure from grained hores and a moderate amount of what-strew bedding. Manure should be fresh from the stable, and it must be composed. The mushroom lives on the products of this decomposition. A slow crop (52-55oF) will last 5-6 months whereas a fast crop (56-60oF) will last only 3 months. The cooler temperature result in somewhat larger, firmer and heavier mushrooms than the higher ones, but the total yield from either is about the same. Mushrooms may appear 35 days after spawing. But 6-8 weeks normally elapse after casing before enough appear for picking to start. Unduly slow growth may be due to poor spawn, improperly composted manure, too many shavings in the manure low temperature, or unsuitable moisture. Process of preserving mushroom has for its leading object the preserventation mushroom so as to prevent the loss of thier natural flavour. This object is a accomplished in the preferred practice by subjecting the mushrooms to an evaporating operation at a temperature of from 100 to 150 degree F untill thier weight has been reduced to approximately one half through loss of water, then washing cold water to elecause and fresher the product, then dropping for a period of from 1 to 3 minutes in a both of sealding water containing citric acid and 5 pounds of salt, then coating with hot cottonseed or olive oil, and then heating for a period of farm 10 to 30 min (depending upon the bulk treated) at a temperature ranging from 212 to 250oF, actually by placing the mushroom at a temperature of about 150oF in a container which is closed and heated to effect the desired sterilizing or processing. While the forgoing treatment has been found to effect the preservation of mushroom without loss of flavour, so that the preserved product may not be distingushed from the fresh it will be varied by omitting certain operations, as washing in cold water and dropping in sealing water containing citric acid and salt and by modifying the degree of the treatment as by changing the time and temperature of the operations, or the mushroom may be sterilized in water or brine directely after being subjected to the waporating operation. It is important however that the treatment shall not drive off or causes the loss of natural Juices of the mushroom, as by the use of high or prolonged heat in effecting the evaporation of the water which is preferably driven off at a temperature between 100 to 150oF. The preservation food in common salt or vinegars is called pickling. Salt, vinegars and lactic acid are the three important ingredients used in pickling. These substances when used in sufficient qualities act as preservatives either singly or collective. Spices & oil are also used. Pickling is done in two stages namely (a) curving or fermentation in drive, or salting without fermentation and (b) finishing and packing. The conditions for proper maintanance has alrady been explained earlier. M/s. B. Sen Berry & Co.